HD Ferries has completed pilotage training for two of its ferry masters operating in the Channel Islands. The company's winter schedule was suspended after Jersey and Guernsey authorities ordered it to train masters to navigate harbours without a pilot. 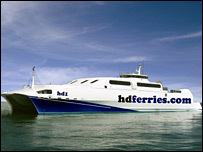 HD Ferries said all masters and mates would be qualified pilots by the time services restarted on 20 March. Pilot exemption training is also being carried out for the company's Guernsey and St Malo ferries. Problems manoeuvring HD 1 in St Helier harbour in August last year led to the harbour authorities in Guernsey and Jersey removing the company's licence.